Rainbow Crystal Prisms - Sundrop Crystal Gifts $38.00 $34.99 On Sale! Almond ~ 63mm, 50mm, or 38mm The always great Almond Rainbow maker! A quilted look, or like a pineapple. Flattened shape, oval with a point at top, with BRILLIANT shining diamond shaped facets. The almond makes stunning rainbows, and is a gorgeous sparkler! This fine crystal is a MUST for your collection! LARGER MAKES BETTER RAINBOWS! Three Sizes! Try the Wonderful Large 63mm size, nice and Big and Sparkly! The Medium 50mm size is not too big and not too small. Enjoy this fine crystal in a Smaller 38mm Size, Clear or AB! Great companion for the two larger sizes! Add a Rainbow of Crystal Beads for even more Rainbow Fun! Genuine Swarovski Crystal $35.00 $29.99 On Sale! Please See Our Wonderful SunDancer 60mm Crystal! Sundrop 28mm~ Clear, Pink, Or Blue The littlest Sundrop is a chunky sparkly crystal that makes Great Rainbows! 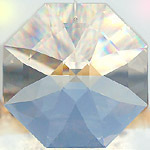 At 28mm this crystal is a good sized 1.25 inches with big shining facets! NEW!! Rose Pink or Sapphire Blue! This little treat is available in Clear Crystal, Delicate Rose Pink, or Lovely Medium Sapphire Blue! (Sorry, AB Sold Out). Gorgeous! News: This wonderful crystal is Retired and no longer being made by Swarovski. Get yours while supplies last! And make sure to treasure it! Add Beautiful Crystal Beads for a Truly Special Treasure! Rainbow Beads, Colorless Beads, or Simple Beauty Beads in Blue or Pink to Match Your Crystal! Enjoy! Genuine Swarovski Crystal $17.00 $15.99 On Sale! Fancy Pear ~ 38mm or 28mm Fancy Pear Crystal! Fancy Pear 38mm Clear Crystal, AB, or COLORS! This wonderful crystal is almost 1.5 inches long, plump, and loaded with Sparkling Facets and Rainbows. As in the photo, you can see rainbow colors in the facets just by holding it in your hand. A truly beautiful crystal and great Rainbow Maker, something your Collection needs to have! NEW!! Lots of Colors! This beautiful crystal is available in shimmering Colorless Clear crystal, beautiful Golden AB, and Several Wonderful Colors! Choose gorgeous Purple (Blue-Violet), Deep Red, Antique Green (Blue-Green), or Medium Sapphire Blue! Need a smaller size? The Fancy Pear 28mm may be for you. This is a sparkly little smidgen of a crystal. Undeniably tiny, about 1 1/8 inch long, but just a GORGEOUS little thing. Loaded with facets, plump and beautiful. Well, if it was a diamond we would call it HUGE! Yes, it makes Rainbows! A beautiful little work of the crystal cutter's art. Enjoy this crystal plain or with luscious Golden AB Sparkle! Genuine Swarovski Crystal $17.00 $14.99 On Sale! Pear ~ 38mm OR 28mm Pear Crystal! 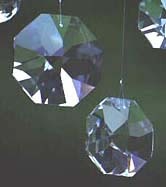 Sparkling Teardrop Shape, Large Flashing Facets. Nice modest 38mm size, about 1.5 inches. This crystal wants to sparkle and make rainbows for you! There is one a little smaller, 28mm, a sliver of shimmery rainbow crystal! The baby of the family, about 1 and 1/8 inch, and even this tiny guy makes little rainbows! Genuine Swarovski Crystal $17.00 $14.99 On Sale! Pear ~ 76mm, 63mm, or 50mm Pear Crystal! The Pear is uncomplicated and a great beauty. One of the absolute best. Something that should be in your collection! It looks like there is a star inside of the crystal. Large, smooth facets. Tap it and watch it twirl for you! Another RAINBOW CHAMPION, this crystal shines, sparkles and makes great rainbows. The Pear 76mm is a full three inches in length, hefty, gorgeous full lead crystal, and packed with Rainbow Making Power! A beauty! We love large crystals! They are so wonderful! Nothing compares to the rainbows from the big prisms. Large crystals are difficult to find, so order one for yourself today! The 63mm size is a bit smaller, about 2.5 inches. This is another fabulous Large Crystal! Next is the Generous Sized 50mm, about two inches. Perfect for a gift, not too big, not too small, lots of Rainbows! The bigger the crystal, the bigger the rainbows! You MUST have one of these for your collection! Genuine Swarovski Crystal $45.00 $39.99 On Sale! Fancy Pear ~ 76mm OR 63mm Fancy Pear Crystal! Fancy Pear 76mm Gorgeous Crystal! There just are not enough good things to say about the Fancy Pear!! Think of a pear-shaped Diamond. One end oval, one end pointed, and just completely covered with lovely facets! A wonderful sparkler and a GREAT COLOR MAKER. Beautiful in bright OR dim light. Try one! This large size is a rare treat, huge, hefty, and waiting to make rainbows for you! This is the King of the Fancy Pear family, a full Three inches in length, with huge rainbows to match. Get one! Too big? Try the Generous 63mm Fancy Pear! Beautiful Size! Two and a half inches of Incredible Crystal! Just like a diamond, lots of facets! Loads of Big Rainbows! This is a crystal we could not find until recently, and we are glad to have it back! Don't miss this opportunity to have one for your collection! Genuine Swarovski Crystal $50.00 $45.99 On Sale! Great Size, Great Rainbows! About two inches, hefty, perfect for a very nice gift. Perfect to combine with other crystals in your window display! Especially pretty facet pattern, a truly lovely crystal. Purple, Blue, Pink, Topaz, Aqua Green, and Pale Spring Green! Wow! The beautiful rainbow-making Fancy Pear in generous 50mm Size, in Gorgeous Crystal ’Gem’ Colors! Select Rosaline, a lovely clear Rose Pink, Sapphire Blue, a great Medium Blue, and Antique Green, the same pretty Bluish Aqua Green as the Crystal Ball and the Star. Peridot Green is a fabulous clear Light Spring Green, just like the August Peridot Birthstone. The Deep Blue Violet (Purple) is a gorgeous deep amethyst purple shade. It’s lovely and different!!! For a special treat, Rose Pink with AB is available. This crystal is a special sparkler, Pink crystal with AB coating. The effect is Sparkly Peachy Pink. Don't forget TOPAZ! Absolutely breath-taking deep, glowing honey-golden Topaz Color! Wonderful! All are Beautiful! Get Yours Today! NEW! Add Gorgeous Sparkling AB Beads to Any Color! Spectacularly Beautiful! Fabulous Gift! Enjoy! Genuine Swarovski Strass Crystal $24.00 $19.99 On Sale! Marquise ~ 50mm or 38mm Marquise Crystal! Yes, just like a Marquise-Cut Diamond! Facets everywhere, and double-pointed oval shape. A work of art and a gorgeous gem. And with all that beauty, it makes rainbows, too! LOVE DIAMONDS? Satisfy that urge with this great crystal!!! Diamonds big enough to hang in your window! Two Great Sizes! BIG two inch 50mm size! Clear Crystal or with sparkly AB gold! And a smaller 38mm size, just under 1.5 inches. A lovely petite but generous size. Perfect companion for a 38mm Fancy Pear. Clear Crystal, Sparkly AB, and several beautiful Gem Colors (limited supply)! Lovely Pale Rose Pink, Medium Sapphire Blue, or Antique Green (a pretty bluish-green). Get Yours Today! Whew! What a great crystal! Genuine Swarovski Crystal $23.00 $19.99 On Sale! Fancy Pear 38 BLUE With AB The lovely Fancy Pear in beautiful Sapphire Blue with AB. This is truly exquisite, a special glowing, sparkling shade of light blue and dreamy AB gold. A very nice little gem! Something you really must have! Genuine Swarovski Strass 8721 $20.00 $17.99 On Sale! Frosted Cross ~ 38AB or 38 JET Delicate Crystal Cross, 38mm, about 1.25 inches in length, very flat and rather dainty with lovely markings. A beautiful, somewhat free-form cross, part frosted and part brilliant polished crystal. Available with shining Golden AB or with dramatic Jet Black accents! Retired by Swarovski, Get Yours While Supplies Last! Genuine Swarovski Crystal $19.00 $15.99 On Sale! Prism Cross ~ 40mm or 40AB New! Shining Prism Cross! Choose lovely clear crystal or gleaming golden AB. Cross is 40mm in length- just over 1.5 inches. Thickness is about 3/8 inch, with the back completely flat and the front having a peak in the center with facets radiating from there to the edges. Simple, elegant, sparkly, and very pretty! Also Available~ Add a string of Sparkling Colorless Beads or a Rainbow of Beads to the Cross for a Beautiful Thoughtful Suncatcher! Genuine Swarovski Crystal $22.00 $17.99 On Sale! Leaf ~ Plain or With Beaded Hanger Crystal Leaf! Leaf~ Beautifully shaped, sparkly Leaf! A full 1.75 inches long, lovely generous size! A lovely shape & a pretty symbol of Nature's bounty. Makes Rainbows, too! Clear or with AB! The 24K gold "ab" coating makes this leaf look like a genuine autumn leaf! A gleaming fallen leaf, full of golden autumn beauty. Crystal Leaf is available Plain or With Beaded Hanger ~ The Lovely 45ab Leaf dressed for the seasons! Genuine Swarovski crystal beads in Autumn shades of gold, orange, and red! Or a refreshing Spring edition in several shades of light green! Both are Very Pretty! Bead Hangers are more intricate than shown in photo. Enjoy! There is also a delicate smaller 32mm (1.25 inches) size. Very small. A tiny glimmering leaf, in AB or Red, full of bright autumn beauty. The Leaf is retired by Swarovski, get yours while supplies last! Genuine Swarovski Crystal $30.00 $25.99 On Sale! Smooth Slice Crystal! Sliced Diagonally from a Gleaming Crystal Cylinder! Like a slice of crystal sausage! Smooth & round with large smooth shining end surfaces. Unique Rainbows! The Smooth Slice makes a large, misty rainbow that can encircle an entire room. Very much worth experiencing! Several Marvelous Sizes! All make the same type of dreamy rainbow! 63mm Size~ Great part of the Smooth Slice Family, just under 2.5 inches, smooth and sleek. Makes lovely long rainbows. A wonderful addition to your Crystal Collection! $40.00 $34.99 On Sale! Fluted Slice Crystal! Captivating & Shimmery! A cylindrical portion of pure crystal, sliced diagonally, with bright lengthwise facets on the outside. Aurora Borealis (AB) 24K gold coating is added to one end surface, making a mirror effect. A beautiful & unique shape, and it shines like crazy! Something very different for your collection! Excellent proportions. Delicate & very pretty! Rainbows too, of course! NEW! Available without AB! Just clear, glittery crystal! The 48mm size is just under two inches long. (Sorry, 68mm Size is Sold Out.) Nice companion crystals for the Smooth Slice! Enjoy! Sorry-AB out of stock. Clear Only. $18.00 $15.99 On Sale! Snowflake Sparkling Crystal Snowflake! Nostalgic for the North but enjoying the Sunny South? Here's a pretty crystal Snowflake to remind you of home. It will never melt, and needs no shoveling! The 20mm size- A tiny little sparkly thing, about three quarters of an inch. A fantastic shining snowflake that won't disappear on a warm day! Shimmery Clear or with AB gold. Enjoy! Swarovski $14.00 $10.99 On Sale! Ball- Swirl Ball 40mm CLEAR with Rainbow Beads NEW! Enjoy a Rainbow of Beads! Swarovski Crystal Beads in Rainbow Colors Added to Beautiful Crystal Swirl Ball with facets in a swirled pattern. Large 40mm Size, 1.5 inches. Clear all through. A truly lovely variation on the theme of the sphere. A beauty to behold. Ever so slightly teardrop shaped, and facets arranged in a wavy swirling pattern rather than by strict straight line geometry. Gorgeous and VERY POPULAR! Great rainbows! Improve your Ch’i (vital energy) – the Swirl Ball and the Ball are great for Feng Shui! Swarovski Spectra $40.00 $29.99 On Sale! Bell 30mm With A Rainbow of Beads Dainty Dangles! Beautiful Swarovski Crystals with Rainbow Crystal Bead Hangers! Crystal Creations are about 4 Inches in Length plus 5 to 6 inches of wire for hanging, 9 to 10 inches total. They are delicate and dainty, not huge or heavy. Perfect for a car decoration, a small windowpane, or anywhere you wish to put them! USA Hand Made here at Sundrop Crystal, with Fine Workmanship designed to last! Wonderful Thoughtful Sparkly Beaded Crystal Gift! The Gorgeous Bell Crystal in 30mm (1 1/8 Inch) with a Brilliant Rainbow of Crystal Beads is Fabulous! Rainbows and Sparkles! Baby Brother to the big Bell 50mm with Rainbow Hanger shown elsewhere. Enjoy! $26.00 $19.99 On Sale! Matrix 32mm or 32AB With A Rainbow of Beads NEW! Enjoy a Rainbow of Beads! NOW! More Crystal Shapes With Rainbows! $26.00 $19.99 On Sale! Icicle ~ 100mm, 63mm, or 40mm Crystal Icicle! Reminiscent of a crystal from a chandelier, this one is angular, long and lovely. The 100mm size is especially beautiful. It is a full Four inches long, and amply proportioned. Very Pretty! The Icicle 100AB is a spectacular crystal made even more special with beautiful AB to garnish it! Long, shapely, loads of facets! Sparkle and gleam! This crystal has it all! Very Beautiful! Smaller but very luscious, the Icicle in 63mm size is gorgeous, long, slender and sparkly! This icicle is 2.5 inches long, a nice substantial size. Especially delicate and pretty. Very lovely with ab gold! One More Tiny Size- Icicle 40mm- A little slip of crystal, something the fairies would hang in the trees. About 1.5 inches long, either clear crystal or with a touch of gold. These icicles will not melt! Enjoy Yours Today! Genuine Swarovski Crystal $28.00 $25.99 On Sale! with Rainbows in your Life! Crystals Make Lots of Fun Rainbows! Baroque Star ~ PERIDOT GREEN Someone was doodling the day this one was created! Outside contours are symmetrical and somewhat feather or leaf-like. Back is flat and smooth. Front has a beautiful star-shaped pattern of large sparkly facets. Different, flashy, and very lovely. Great for low light. NEW!! Available in pale Peridot Green! This crystal is absolutely lovely in this beautiful new Light Spring Green Color! Two Wonderful Sizes ~ Luscious Big 63mm, 2.5 Inch Size, or Generous 50mm Size, 2 Inches. Enjoy Today! Genuine Swarovski Crystal $24.00 $19.99 On Sale! Remember- Big Crystals Will Make Large Rainbows! The Crystals on this Page are not the only Rainbow Makers! Lots of other crystals are quite good at it, too! HINTS ON SIZES: 18mm is 3/4" (large earring or Dime size), 28mm is 1 1/8" (pendant size, bigger than a Quarter), and 40mm is 1.5 inches. It doesn't sound like much difference, but remember, they are also thicker, heavier, and longer in addition to being wider. The difference in appearance is quite striking! These three sizes are all perfect for a window display. The 40mm is most dramatic, 28mm is smaller but still a good size. The 18mm is a good one if you like small crystals or have a display with large crystals and need some smaller pieces for contrast. Here's a ruler showing both inches and millimeters (mm) so you can see the comparison! 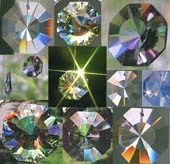 COLORS: Crystals are colorless if listed as "mm" (millimeters). The letters "ab" stand for "Aurora Borealis". This is a light coating of 24K gold that gives the crystal iridescent coloring and gold brilliance. It is designed to give colors to a crystal in low light. It still allows it to make rainbows in sunshine. If you like the pure beauty of crystal, get "Clear". If you like a visual impact in any light, and some extra color, try the crystals in "ab". AB is bright and shimmery but is not invisible. It makes changing colors on the crystal the way oil on a puddle makes Rainbows. Providing Fine Swarovski Crystal to You Since 1998. Buy an identical pair of crystals or crystal pendants. Give one to a friend, and keep one for yourself. These will be a special reminder to you both of each other! You may catch your special crystal winking at you, perhaps when your friend is thinking of you!